When the sisters got back into horses, the horse experience we imagined did not, in fact, exist. We started with traditional riding lessons, but found that riding lessons were only a small part of the possibilities that exist with horses. We spent about 4 years exploring the horse world. We went to a dude ranch. We volunteered at a horse rescue. We attended clinics, took lessons on the ground and on horseback. We helped friends with horses, mucked stalls, doctored horses and taught groundwork. All of this exploration also included hours in the car together talking about the horse video we watched last night, or the book or blog we found. That time also allowed for our favorite discussion, how we would solve our most intreguing horse world problem. From our perspective, there were a lot of horses that needed time, care and exercise. There was also a possibly corresponding number of horse lovers that only had access to horses in the context of a riding lesson, lease, or a rented trail ride. These same horse lovers also had neither the time nor the resources to own their own horses. The existing models we found to bring these horse and human populations together were expensive, limited, and in some cases even disabling. In all cases, they lacked the opportunity to forge a relationship with a horse that would make all other activities more fulfilling. So we turned our focus away from what existed and turned toward what our ideal horse experience might look like. In no particular order, we wanted nice horses, enough land to support them, and enough people to tend the land, the horses and each other. Horse work can be lonely because the most important discoveries happen when it’s just you and the horse. We wanted other people to be able to share that with and share in their important discoveries. We also wanted to make it possible to have those experiences, to have meaningful relationships with horses even if you don’t own them. 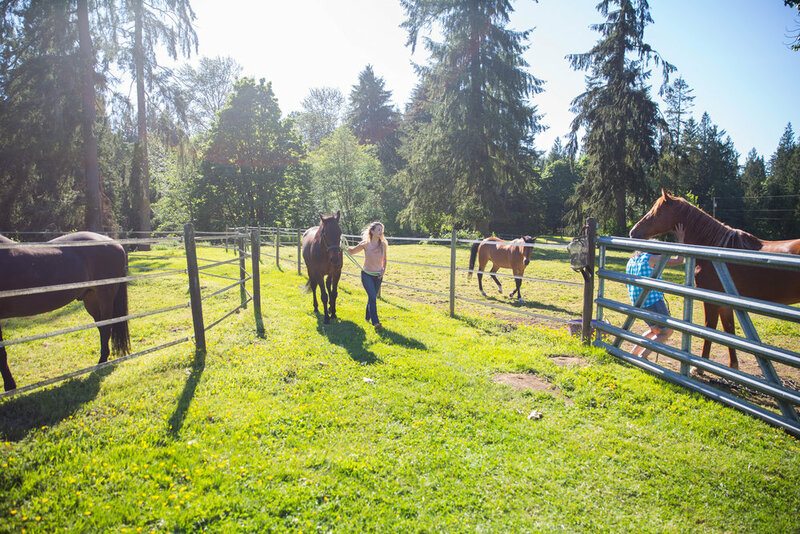 In 2012, we found the horses and a collaborator, Lilly's owner Donnell. Donnell worked with us from the beginning, providing the original location, a ton of knowledge and a much needed infusion of courage. The three of us were then joined by the small group of people that were willing to try our grand experiment with us. Because the model is new, we’ve had to learn and create a lot. Though the concept continues to evolve, our core desires have stayed the same. We want to build a community that promotes growth and well being through our relationships to the animals, the land and each other.